It is really hard to sit here and write this update. I have not had the energy to post any updates in the last few days. Over the last 3 weeks, Gabby has gone through more than any five year old little girl should. She has gone through more than any person should have to go through. Between MRI’s, IV’s, two trips to the OR, 12 days of sedation, and the other countless things that she has had to endure. Over the last few days her head has been hurting from time to time and she has gotten sick a few times. She does not really eat anymore and is starting to lose weight. Over the last two days she has had one spoonful of Mac and Cheese, two strawberries, some rice crispies, a few french fries, and half a Mc Flurry. A feeding tube was discussed a few days ago and they are monitoring her closely. To top it all off, we have moved officially 6 times within the hospital. Two times in the last 24 hours. 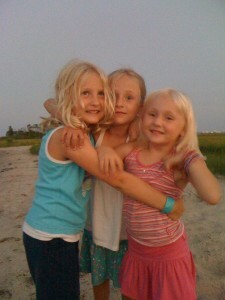 This week Gabby was suppose to be down at the shore with Nana, Pop Pop, and the rest of Carolynn’s family. We have been doing this trip for the last few years. It’s a great time and she really has a lot of fun. She loves the beach, playing in the sand and the water. She loves to jump in the waves with me and her sisters. We often go too deep for her and she runs back to the safety of mom’s legs. There is no beach trip now. No trip to the boardwalk to get our annual chocolate eclair funnel cake, no mini golf, no amusement rides, no sand castle building, etc etc. Gabby loves the sand and somehow manages to get it in every nook and cranny. Somehow she manages to do this even if we don’t head to the beach that day. Amazing! She is truly beautiful to watch as she runs through the sand after her sisters. Instead of being at the beach, I’m sitting in a hospital room watching her sleep. I’m sitting in a chair typing this while Carolynn is on the other side of the room eating dinner. Her dinner consists of a day old turkey sandwich and some chips and salsa. The closest we are to the beach right now is being in the building called Seashore House. The week after this started, I left the hospital for a day to take my other girls to their school fair. It was to try to keep their lives “normal”. Last year we went as a family to the fair. There was this lollipop game that Gabby loved. It was a tree of lollypops and when you pulled one out the stick had a color on it. The color determined how many tickets you got that would turn into prizes. Gabby loves lollipops and could have cared less about the tickets. Everything about this fair reminded me of Gabby. I would never wish this on anyone but as I wandered around that day and every day since we got here, I have to wonder why her? Why not you or that person, or the person next to them? That’s when the anger comes out. I know there is no answer to this question and I shouldn’t be asking it, but I can’t imagine a day where I won’t ask why Gabby and not you? I know it sounds harsh but I want the little girl that’s sleeping in front of me to be running on the beach playing in the waves down in Ocean City. From time to time I have to pause typing just to watch her sleep, breath, fidget and hopefully dream good dreams. The Physical and Occupational Therapist were very optimistic she would improve quickly. She played a game in Occupational therapy with Carolynn and I. Tomorrow is her 6th day of radiation treatments. According to Gabby, that’s 6 yuckies gone and just a few more to go. Today was the first day of therapy in the Seashore House. Tomorrow is suppose to be a longer and more intense day of therapy. She is going to be working with Physical Therapy and Occupational Therapy for 3 hours a day. She is also going to be working with music, art, and speech therapists. 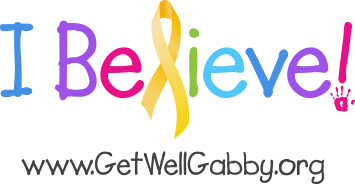 Gabby has the strength and the will power to get better. There is light at the end of the tunnel. Each day she is getting closer and closer to coming home to pet her dog Posey. God Bless you and your family. It is unimaginable to think what you and your family have been through. I am the mother of three girls,and your story has touched me. We all pray every day for the “cute little blonde girl with the Yuckiesl” as my 6 year old calls Gabby. I applaud your honesty. It’s hard to reconcile the trials we are given and as much as we all want to be good people, you can’t help but think about the fact that you have lived your life with integrity and other people deserve this more than you. I get that feeling all the time with my son (who is special needs) and always feel guilty about thinking it, but think it anyway. I am proud of Gabby for getting through so much and pray for her every day. Bless you and your family and my spirit is in that hospital room.